The wonderfully weird adult playground finished its summer season in style last Friday in Ushuaïa. 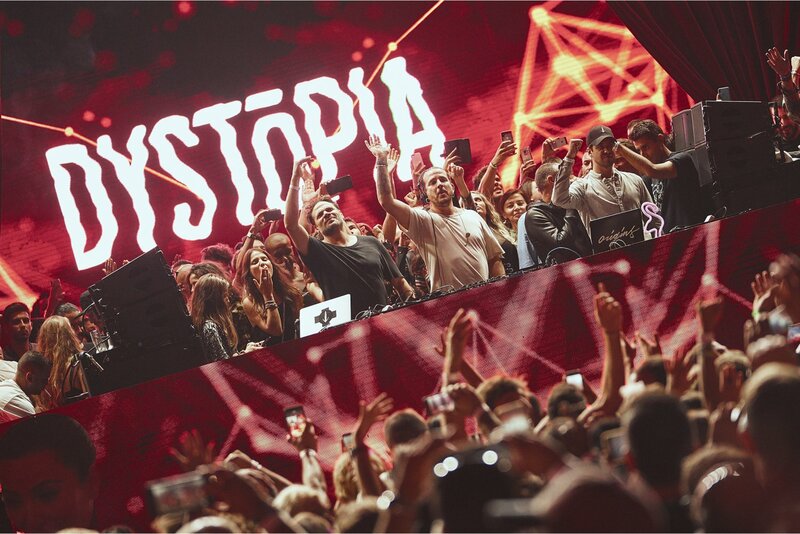 The summer season of DYSTOPIA brought the vibe of a fun-filled wonderland into the open-air grounds of Ushuaïa. This was the party concept which refused to conform. Bizarre aesthetics combined with mysterious melodic sounds made for an intriguing experience for Ibiza dancers. Within the palatial hotel and venue space, a whole host of dancing and prancing characters cavorted around the party. The range of stalls and pop-up experiences, each one more weird than the last, gave visitors the liberating freedom to be as crazy as they wanted. Musically, DYSTOPIA did a brilliant job of garnering a top roster of electronic music artists to play week after week. With Chilean-Swiss DJing maestro, Luciano at the helm as a resident, each and every event brought something new and exciting to the table. Last Friday was the finale for this tumultuously strange party and certainly made the last one very special. Raúl Rodríguez and Miss Melera got the crowd grooving in the early afternoon sun. Bedouin followed and had hands in the air during his set as the sun went down. But the best was yet to come. The leaders of the Afterlife party and label, Tale Of Us were the very special guests for the evening, supplying their signature melodic sound to the hordes of DYSTOPIA. Firebrand beats echoed around Ushuaïa, as stage production exploded over the crowd in a hail of streamers. Following a solo Luciano set, Tale Of Us went back to back with Luciano for an electrifying last hour which had people dancing right until the end. Check out the top track selections and photos from the DYSTOPIA closing below. Raúl Rodríguez getting the party started. Shocking twist: Ushuaïa Ibiza is in the matrix. The Bedouin duo playing to crazy clubbers of DYSTOPIA. Their sound felt right at home. The most bizarre party on the island. Tale Of Us conjuring magic on stage. The party's madness depicted in all its glory. Luciano and Tale Of Us share a laugh behind the decks. Explosive finish for the DYSTOPIA season finale. Another party wrapped up in style for the summer. We honestly cannot wait to see what DYSTOPIA might bring to Ushuaïa in 2019. For now though, to appease your yearning for more fantastic tunes head on over to our DYSTOPIA Spotify playlist and immerse yourself into a dystopic future wasteland.